I got an iPhone today! I've been playing around with it. I took a couple of pics and I wanted to see if I could upload them. Wow congrats on getting a new I Phone! What an awesome thing for you and I hope you have fun with it! 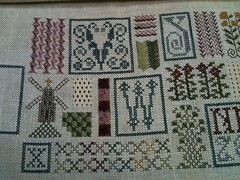 I love your Sampler of Stitches! It is so pretty! Seems to have worked just fine! Have fun with your new toy! have fun with your new toy. I really want to get one but I know I would be hooked to it all the time LOL There are many cool apps out there. Enjoy your new toy! I have an older iPhone 3G and love it. I'm trying to hold off upgrading until the I see if the rumors of the new 4G coming out next month are true. Now I'm jealous Nicole! The boy just bought himself a droid and is having fun with all the gadgets and apps. I want apps!!! Pretty good pictures for being taken by a phone! The iphone is my husbands favorite items in the whole world! Enjoy. Both my DH & I have iPhones - I don't know how I ever lived without one! Enjoy your new toy! 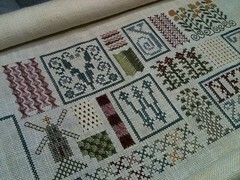 Sampler of Stitches is looking wonderful!! I can't live without my iPhone. I've had mine for a year, and I honestly don't know how I ever functioned without it! It takes really nice photos too. I love my iPhone and couldn't live without it! You'll have to check out the Suzy's Stitches app, it's the only one that I have found for needlework so far. Enjoy playing with your new toy! Congrats on your new toy. They are very addictive. :) I frequent the app store. :) SoS is looking fabulous! Wow!!! now you can blog on the go!!!! Congratulations on your new toy!!! Lucky you!!! I'm jealous!! He he! Enjoy!!! yes ! iphone is a great gagtget phone .. but in fact so funny and absolutly "indipensable en français !"